The kids are more interested in Halloween this year so I decided to make a wreath specifically for Halloween instead of just fall. 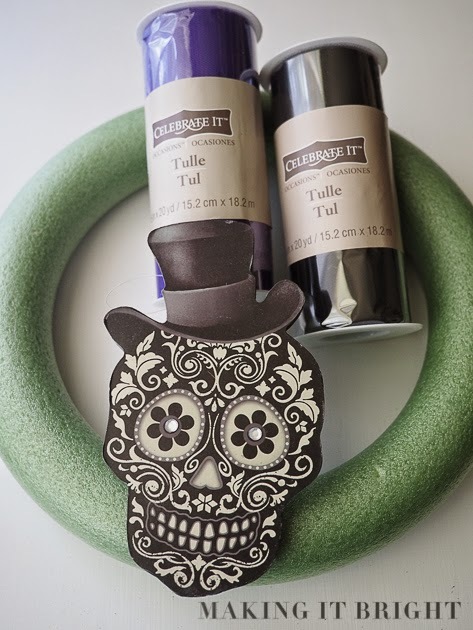 I already had a 12" foam wreath, so my little lady and I set out one afternoon to Michael's to pick out tulle and something fun to decorate it. I let her pick the colors and she initially wanted red and green and purple. Like Christmas gone awry. I had originally wanted all black, and somehow I convinced her to go with purple and black. I'm glad she insisted on a little color. And I spotted the skull (more Día De los Muertos than Halloween) and she agreed that it wasn't too scary. 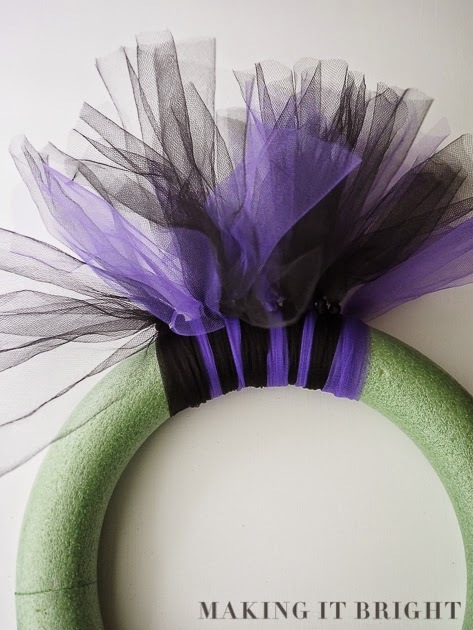 I started with 20 yards of each color of tulle and quickly decided to make my pattern of one purple loop and two black loops. So I had to pick up another roll of black tulle to finish the project. 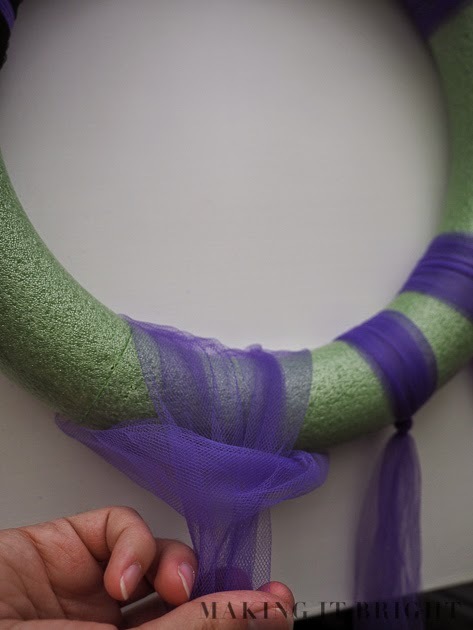 I measured each piece of tulle to be roughly 24 inches, folded it in half, and then looped it around the wreath, knotting it on the outer part of the circle (as seen below). I found it easiest to just use a 12" ruler and let the roll of tulle rest on the floor while I measured and cut in my lap, cutting several pieces at one time so I could cut for a while and then knot for a while. Good to mix it up to rest your hands. After I looped it through as shown above, I did a quick knot to keep the tulle on tight. I really squished the loops together to get a nice pattern on the wreath. My daughter said that it looks like a witch's socks. I'll take it. 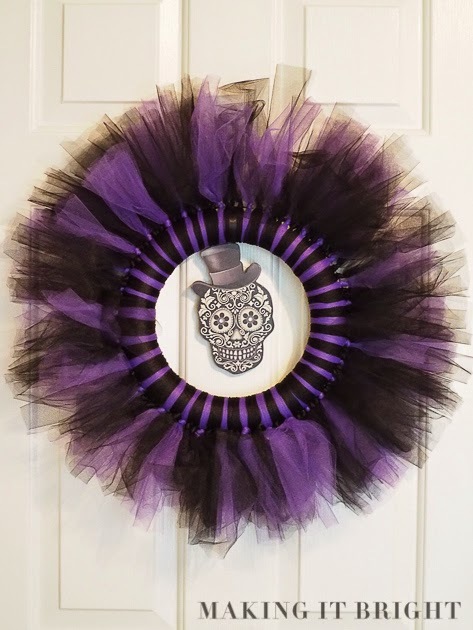 I used a black satin ribbon from my ribbon stash to attach the skull to the wreath and to make a little loop on the backside of the wreath to hang it on the door hook. 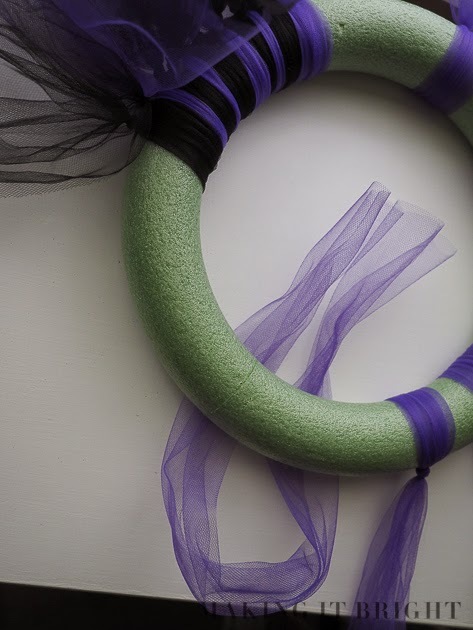 A simple and relatively quick Halloween wreath project. 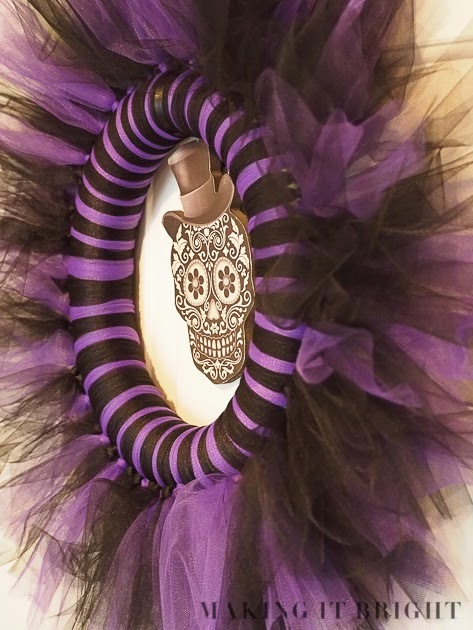 What do you have planned for your Halloween decor?